When I started building the werewolves’ culture for my books, I wanted them to feel absolutely grounded, as real as any culture you’d discover in our world. One thing I knew I needed for that was their mythology and religious teachings. I didn’t model them on any real world mythology in specific, but I did draw heavily on my knowledge of various Native American stories from my training as an archaeologist in the Pacific Northwest. I think anyone who wants to create a mythology for their own world can go through a similar process. Now, a professor of folklore or anthropology could probably list all kinds of different aspects of mythology that are important, but I focused on a few in particular when creating my Were myths. The first thing I came up with was their creation story, but that’s really just one part of a bigger function of myths: explaining the unexplainable. Imagine a pack of Were back in history, before science. They’d want to know, where did they come from? What’s their purpose while they’re here? Where do they go after death? I’m sure you recognize those sorts of questions from plenty of human sources as well. So the creation myth answers where they came from, and sets up the gods and cosmos so they know what they return to after death, as well. Getting into more specifics, I drew on the common theme of many mythologies, in which things were absolutely perfect until someone screwed it all up. The Were lived with their gods, the Lady and Death, until the humans came to kill them with fire. Death was forced to teach them of mortality himself, so they would know to fear it and avoid being slaughtered. Another thing I wanted to do was fill the Were mythology with elements that reflected the Were’s day-to-day life at the point the mythology would have developed. When you’re trying to explain the unexplainable, you use things that make sense to you: like a tribe describing the sky as an unturned basket made by the gods, a bigger version of the baskets they use every day. The moon and its light are central to the Were’s mythology, as manifestations of the Lady, so they say the stars are the broken pieces of her first child, that she tried too much to make just like herself. The moon is a key part of a Were’s everyday life, so it’s how they define the rest of the cosmos. Of course, another function of a good mythology is to teach morality. In the teaching parables that I came up with for the Were, I focused on the kind of things that werewolves would need to teach their children, like wariness of humans and pack loyalty. Then, when the subject of the parable made a mistake, I made sure the consequences were larger-than-life, worthy of a tall tale. It won’t appear until book 3, but in one of the Were stories, a woman who cannot forgive doesn’t just drive away her pack, but actually transforms into a rattlesnake, forever doomed to rattle her grievances to whoever will listen. Now those are the kind of consequences that will get a kid’s attention! A few things, I purposely made different. Rather than have the Were define the soul in a typical way, I picked another intangible thing about people to invest with that meaning: their voice. I figured that howling is so key for wolves that the Were would already be quite voice oriented. It’s the same concept as a soul: a Were’s voice is greater than some air being pushed through some muscles by some other muscles, the same as the Western concept of the heart is greater than some red cells and plasma being pushed around by another muscle. When Were die, it’s their voices that Death takes back to the Lady. I’ll end with the trickster. Every good mythology needs evil, whether it caused everyone to fall from the perfect world, or drives the mistakes in the parables. And even more fundamentally, it’s an unexplainable thing that needs explaining. Why is there evil? Why did someone else do something bad to me or those I love? But the world is also full of chaos, and some of my favorite characters in mythology are the tricksters who create it, like Coyote and Raven. Sometimes they have selfish goals, sometimes they want to shake things up, and sometimes they just think it would be funny. When I have Death speak to Silver in the books, that’s often what he’s channeling: a force for chaos, change, and movement. Which may well be positive in the end! After a lot of trouble, of course, which Death can laugh at. So taking even just those few basic elements—explaining the unexplainable, matching everyday life, teaching morality, and including evil and chaos—I found myself with a living, breathing mythology in no time. I pinned down a few basics off the page, like the creation story and where the Were go after death, and then let the rest of the parables and tricksters crop up as I needed them. I get excited whenever I find a place on the page where a reference to a parable will fit, because then I get the fun of coming up with it! 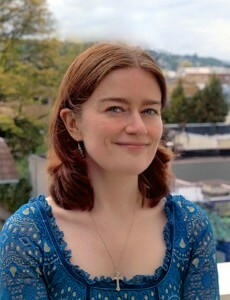 Rhiannon Held is the author of SILVER, and TARNISHED, the first two novels in an urban fantasy series published by Tor Books. In her day job she works as a professional archaeologist. Unfortunately, given that it’s real rather than fictional archaeology, fedoras, bullwhips, aliens, and dinosaurs are in short supply. Most of her work is done on the computer, using databases to organize data, and graphics programs to illustrate it. This entry was posted in Uncategorized and tagged Rhiannon Held, Silver, Tarnished, Werewolves by chadwickginther. Bookmark the permalink.